Norma Stacey, Val Tapene, Linda Williams and Faye Reid. 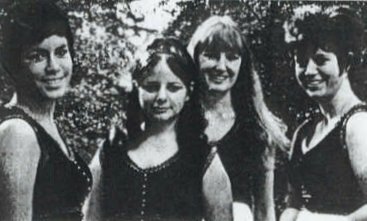 The Fair Sect were New Zealand's first successful all-female pop group. They originated from Auckland in 1965. Being an all female group certainly had its problems for the girls. At that time it was a most unusual combination in a male dominated scene. Girls were not expected to be playing electric guitars and drums. As such they attracted a lot of interest, purely for curiosity value. The group was started by Val Tapene and Norma Stacey, who placed an advertisement in the newspaper looking for girls who wanted to play in an all-girl pop group. From the responses they selected Linda Williams and Faye Reid, and the Fair Sect were on their way. Linda was the sister of John Williams, lead guitarist for Larry's Rebels. They made their debut in September 1965 at the Shiralee, and then played at socials, parties and RSA dances. Owners of established venues didn't pay them too much attention. Val Tapene was the first to call it quits. She was replaced by Yvonne Gray, who was a guitarist, not a bass player, so Faye Reid switched to bass. Norma Stacey was the lead vocalist, but also played the drums. She found it easier to play the drums standing up, a style that was copied by a few other drummers in later bands. In 1966 they released their first single called "Kimberley"/"Never Again" on Zodiac Viscount. At this point Norma wanted to concentrate more on her singing and be out front of the band, so a replacement drummer was sought. In late 1966 Ian MacIntosh was recruited. He had originally been with the Feet Beats, but joined direct from the Rogues. While he was with them, they became known as the Fair Sect Plus One. Their second single, released as Fair Sect Plus One, in 1967 was "I Love How You Love Me"/"Mohair Sam". The song "I Love How You Love Me" was a different reworking of the old song, featuring bagpipes as the lead instrument, played by Ian MacIntosh's brother-in-law. The single reached number 13 on the local Auckland charts in December 1967. It was released on the Allied International label. In early 1968, Ian MacIntosh and Norma Stacey left the group. Their replacements were Gaylene Aro on vocals and Pat Rewai on drums. Linda Williams switched to organ at this time. A single was recorded, actually using Pat Rewai on vocals, but this wasn't released until later. Pat didn't stay around very long and was soon replaced by Jenny Parkinson, who also only stuck around long enough to sing on one single with the group. Her recording was actually released as the groups third single. It was called "High Flying Bird"/"Big Spender" and came out back under the name Fair Sect in 1968 on the Pye label. Jenny's replacement was 16-year old singing sensation Mary Bradfield. Gaylene Aro, Mary Bradfield, Linda Williams and Faye Reid. The band toured most of the main North Island centres and worked in most of Auckland's major pop venues, like Club Bo-Peep, The Tabla, Galaxie, Platterack and Top 20. In 1969 the single featuring Pat Rewai was finally released on the Zodiac label. It was called "Rattler"/"Bye Bye Baby". They moved to Australia in 1970 and their first appearance was at the Moomba Festival in Melbourne. They made appearances on local television, but work and gigs were few and far between. After a lot of trying, they finally got a regular gig at the Federal Hotel and they based themselves there for the best part of a year. Linda Williams left and was replaced by June Littin on keyboards. Mary Bradfield also left and Kaye Wolfgramm (cousin of Le Frame's Max Wolfgramm) took over on vocals. 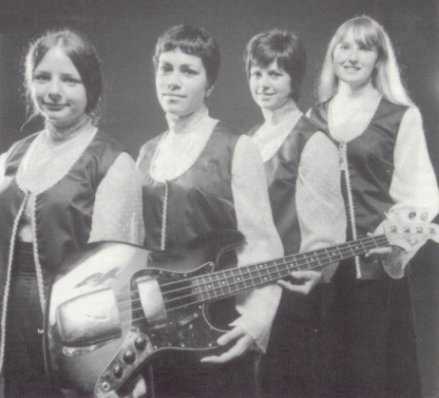 The final line-up of Fair Sect, which now consisted of Faye Reid, the only original member, Gaylene Aro, June and Kaye, headed to Canada before finally disbanding in 1972. Kaye Wolfgramm joined Cruise Lane as vocalist. Yvonne Gray later appeared in seventies glam-rock band Noazark. June Littin was a co-author of the Maria Dallas classic "Pinocchio", which topped the New Zealand charts in 1970.